Our lake house is located on a corner lot in a quiet neighborhood. It is a three bedroom one bath home that was completely remodeled from floor to ceiling just two years ago. The lower basement makes the house sit higher off the ground which makes the home feel as though you are in a tree house. There are 35 mature trees on the lot where the house is located. The second floor entrance to the home is accessible via a gently sloped ramp on the side of the house. The front and side of this home has a large elevated deck that is perfect for enjoying the outdoors. The neighborhood is located in Indian Springs, and has a public boat ramp (.5 miles from house) with parking, as well as beach access and trails. Once inside the house you immediately notice the gigantic floor to ceiling windows that bring the beauty of nature inside for your enjoyment. This home is on the smaller side but can easily accommodate 6 guests comfortably. One of our favorite bedrooms is located in the upper loft of the home overlooking the living area. The entire home is full of character and many of the original elements were preserved when the home was remodeled. The home is equipped with Direct TV and high speed WIFI internet. A Blue Ray DVD player is also connected to the TV. There are two queen beds and one full bed. Lake Eufaula State Park is located 4.5 miles/7 min from the house. Dollar General is located one mile away. Several local restaurants are within a mile or two for your convenience. Both the town of Eufaula and Checotah, OK are within 10 minutes. Home is easy to locate and only a couple miles off the interstate. Public recreation is located in the immediate vicinity. From ATV trails, horseback riding, bike trails, walking trails, public swimming areas, and public lake access for boating and fishermen, marinas with boat rental, to water obstacle courses. This home has a large circle drive which can accommodate both boats and RVs. As of 10/16/2018 the house has been connected to the city water system. Prior to this the home used well water. The well water system had iron water that had a mineral odor, so we made the decision to connect to city water to improve the guest experience. 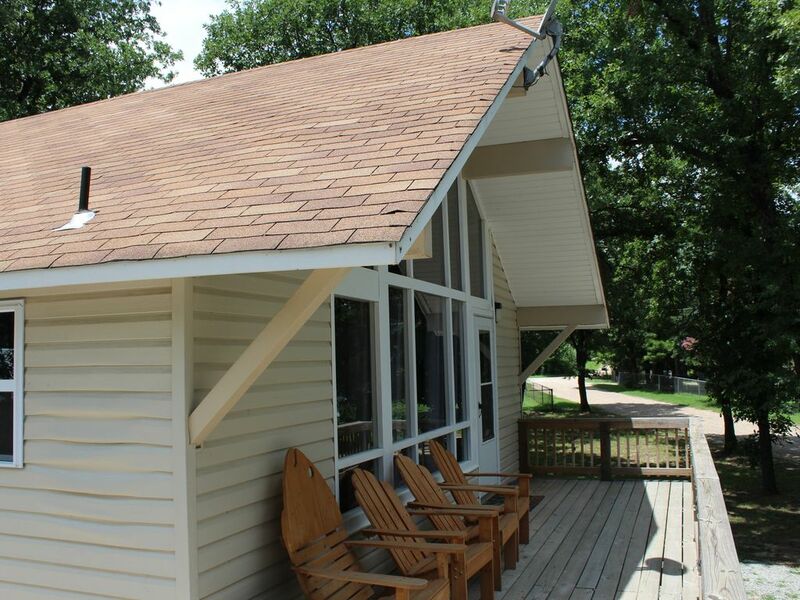 We know you will enjoy our lake house as much as we do and look forward to having you stay! I grew up and currently live in the Fort Smith, Arkansas area. I graduated from the University of Oklahoma with a bachelors in Biology. My current employer is a logistics company and I work in sales for residential moving. I love to travel and explore as much of the world as I can! We had everything we needed and more! Loved sitting in living room and looking out the big windows out to the deck. I would love the house plans to build my own vacation home! Very comfortable felt very much at home. Such a cozy homey feeling! We very much enjoyed our stay. Water is polluted with Sulphur as evidenced by strong odor and stains in tub and toilet. No cell phone service with some providers. Poor nighttime lighting. Sheer curtains do not provide privacy. "Neighborhood" setting allows no privacy or view. Furniture very uncomfortable. Stayed only one night of three that were booked and paid for. This house was the perfect size for our family of 6. It was very clean and the owners were accommodating. The circle drive was great since we had our boat. My family and I wanted to take a fishing trip to Eufaula, so we reserved this house. We usually go 4 times a year. We arrived at this house and it was perfect. It was so relaxing. It was plenty of room for the 6 of us. The lake is just a short distance up the road. We didn't want to leave. The owner was very friendly and made sure we didnt have any concerns. The neighbors are super friendly. Even if you dont want to go to the lake, this is house is perfect to just relax. We will definitely be back.